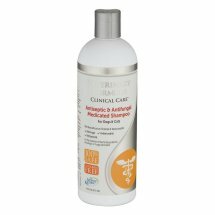 Veterinary Formula Clinical Care Medicated Shampoo for Dogs & Cats Antiseptic & Antifungal. Veterinary Formula® Clinical Care™ Medicated Shampoo for Dogs & Cats Antiseptic & Antifungal. With Benzethonium Chloride & Ketoconazole. For The Treatment Of Bacterial Pyoderma And Allergic Or Fungal Dermatitis. 16 FL OZ (473 ml). Purified Water, Coconut Oil Based Cleansers, Ketoconazole USP, PEG-75 Lanolin, Fragrance, DMDM Hydantoin, Glycol Distearate, Benzethonium Chloride, Tetrasodium EDTA, Aloe Vera, FD&C Red # 40.Active Ingredients:Ketoconazole USP ... 1.0%.Benzethonium Chloride ... 0.2%.